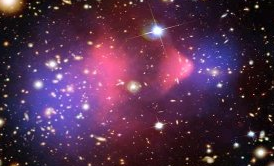 NASA held a news conference in 2006 claiming the Bullet Cluster (1E 0657-558) proves that dark matter exists. It actually proves that believers can adjust the evidence to fit the assumption they were trained to think with. Astronomers claim that the Bullet Cluster is really two clusters that passed right through each other long ago. In the above optical image, the two clusters are the clumps of orange galaxies on the left and right. Half way between the two galactic aggregations, right in the center of the picture, lies the largest galaxy in the image. Image credit: NASA/STScl; Magellan /U.Arizona/D.Clowe. X-rays in deep space come from high speed particle collisions. These X-ray clouds commonly envelope galaxy clusters, which is evidence that they formed violently. Scientists claim the X-ray emitting gas in the two clusters slowed down as the two clusters passed through each other. Please notice that both clusters are enveloped by a large, nearly circular, red X-ray cloud. 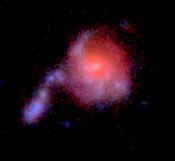 The center of the red X-ray cloud is the large, central galaxy with the halo around it. On the right side we observe an X-ray bullet. On the left is a bright but diffuse X-ray cloud. Notice that the cluster on the left has more galaxies than the one on the right, which may indicated it formed first. 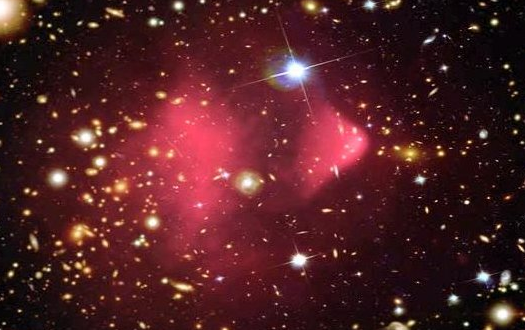 Astronomers explain the X-ray bullet by claiming the presence of large amounts of dark matter. Astronomers modified this combination X-ray / optical photo by airbrushing two blue clouds that represent the imagined invisible matter. Allegedly, the invisible matter only has gravitational properties. If the Earth were to plow through a cloud of invisible matter, it would pass right through us without any interactions, except gravitational. The story is that the invisible matter is attracting the X-ray emitting gas. Allegedly, the powerful gravity of the invisible stuff is pulling the bullet out from the less intense X-ray cloud between the clusters. Image credit: X-ray: NASA/CXC/CfA/M.Markevitch et al. ; Lensing Map: NASA/STScI; ESO WFI; Magellan/U.Arizona/ D.Clowe et al. ; Optical: NASA/STScI; Magellan/U.Arizona/D.Clowe et al. The Bullet is evidence for how the two clusters and the X-ray cloud spread out from the large galaxy that lies between them. We find two symmetrical X-ray and gamma lobes centered on the core of the Milky Way. This is evidence that the core of our galaxy was involved in violent ejections long ago. The miniature Magellanic galaxies are connected to the core of the Milky Way by a river of neutral hydrogen. Evidently these small galaxies were ejected from the core of the Milky Way. Jets, gas tails and X-rays in galaxy clusters suggest that small galaxies were ejected from the large ones. Galaxy clusters are grew from parent galaxies. They did not condense from space dust. The Bullet suggests that two clusters were ejected from a central, active galaxy. Scientist cannot accept that small galaxies emerged from large ones because their structured way of measuring and mathematicating was built on the assumption that the properties of matter are fixed, not emergent. 1. The size of a galaxy cluster is the area of the X-ray cloud. 2. The focus (origin) of the clumped galaxies (and the X-rays) seems to be one or more giant ellipticals. 3. Evidently, the enormous galaxies shot out the X-ray clouds along with the strings of small galaxies that surround them. Galaxy clusters are emergent phenomena where we observe the evidence that small galaxies emerged fro giant ellipticals as the properties of matter continuing to change. A literal biblical creation explains visible cosmic history. It also explains that the creation is enslaved to change. First God created, completed action, the heavens and Earth (the entire universe). The next sentence begins with the Hebrew waw: a particle that can mean and, but or then. But the Earth was (completed action verb) unformed and dark. How did the Earth get extension? Elohim’s wind dithered in unbroken continuity above the primordial surface (Hebrew paniym) as He continued to command light to continue to be. To this day, light never stops dithering around within all matter giving it extension. Early galaxies evidently were made of unformed matter, like the Earth, since the Bible explains how the stars were formed. Elohim continued to command lights in the raqiya shamayim (the things that spread out in the heavens). The lights were to shine on the Earth to divide day and night and to distinguish seasons, days and years. He continued to make two great lights for ruling over the day and the night and the stars also. He continued to set them in the raqiya shamayim (the things that spread in the heavens). According to Isaiah 40:26, He created (completed action) the stars and continues to lead them out by name. It is because of the greatness of his might that stars do not go missing. Several other biblical passages explain that God continues (in unbroken continuity) to spread out the plural heavens. Visible cosmic history shows stars and gas continuing to emerge from unformed matter in the core of each galaxy. Billions of galaxies grew into huge, local, dusty growth spirals as countless stars took form and followed each other out in lanes. This photo from NASA’s Hubble from the Ultra Deep Field shows strings of blue stars globs emerging from the redder core of an ancient galaxy. Galaxy UDF 4491 shines at 48% of the light frequencies of modern atoms. How could this be? We observe that primordial atoms shone at much lower frequencies than modern, local atoms. We observe how the properties of matter continue to change relationally throughout cosmic history and the proof is how the stars continued to emerge from the unformed matter God created first. The Bullet is simply one of countless evidences that galaxies and galaxy clusters continue to emerge and spread out from their unformed origins. Doesn’t this mean the universe is very old? Indeed it does. Hebrews 11:3 states that the plural eons were passively put in order by God’s command out of things unseen. Galaxies took vast eons to grow into huge growth spirals as they visibly grew out of the unseen things in their cores. 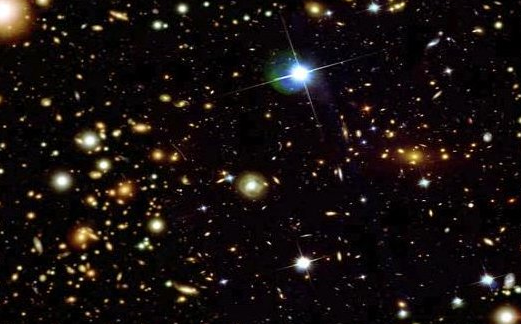 How could galaxies form in only 6,000 years of biblical history? Please observe that the atomic clocks accelerate along with the outward moving star streams.